Greetings on this allergy-ridden day. A couple of people over on Twitter had recommended I buy this set, in order to get hold of the White “Classic” Space promotional minifigure, which I hadn’t even been aware of. Why not, I thought, because I liked the idea of having brick-built storage boxes. Primarily for the benefit of anyone else who didn’t know about this set, here’s a review. This is another one of those plain box sets you’ll find at the back of LEGO stores. What you might not find, however, is the Minifigure Presentation Boxes set, which has coincidentally been discontinued. Actually, the plain box design may indicate that it can only be found in LEGO branded stores, or that it’s exclusive to certain retailers. The back of the box shows that the boxes can be stacked (which I think is a given), and that if you want a completely plain Black box you can switch out a few parts to make it happen. This plain minifigure in overalls is the set’s scale reference. There’s nothing but a few words in 925 different languages on the sides of the box. Apart from some Red boat tiles, two Green 1×1 round plates and a Red bucket, there’s nothing really exciting in this selection: these are all the parts that don’t fall under the other categories. If you’re into your tiles, however, this picture paints a different story. I’m really not a fan of Red elements in general, but even I can’t pass up ten 2×4 tiles (which is the most you’ll currently find in one set). We also get eight of these in Black. Apart from that huge 2×8 45 degree slope in Red, all the slopes in this set are of the cheese variety. Make sure you don’t lose any of them, even the red ones. Four each of Red and Black 4×4 round bricks. The Red ones are uncommon, found in three other sets: Coast Guard Patrol from the City theme, The Shellraiser Street Chase from TMNT, and the ultra elusive LEGO Duck employee gift. You’re welcome to do your own analysis, but note that the Red 1×12 bricks aren’t as common as you think. This set is your best source of 4×12 plates in Red, as it usually appears once or twice in other sets. Having lost his wifey in the Desk Business Card Holder review (probably the worst review I’ve ever done), this generic minifigure has turned his hand to painting and decorating. (Yes, I’ve also made the assumption that this minifigure is male.) He comes with the awesome paintbrush introduced by the S4 Artist from the Collectible Minifigures. The Black box is the first one to be built, and it all begins with this base. The Tan 4×4 plate is incorporated into the base, but if you prefer you can use a Black 1×4 plate instead – should you change your mind you’ll have to take the box apart. Note that the Black 4×4 wedge plates have been used midway: these will help to stabilise the drawer once it’s inserted. With the walls of the box being built, there’s a spot where two Green 1×4 bricks are used to simulate a painted surface. Again these can be replaced with Black 1×4 bricks, which (along with a Black 1×4 plate) have been graciously included in the set. Trying to put the past behind him, the decorator sits on his platform and gets to work. He’s got enough paint to do the whole thing at once, he thinks. The drawer doesn’t have a stud in sight, as it’s covered in cheese slopes and tiles. We get a tiny handle to open and close it, too. The drawer fits fairly easily inside the base, but you may have to tilt it a little. Be careful not to disturb the decorator, either. 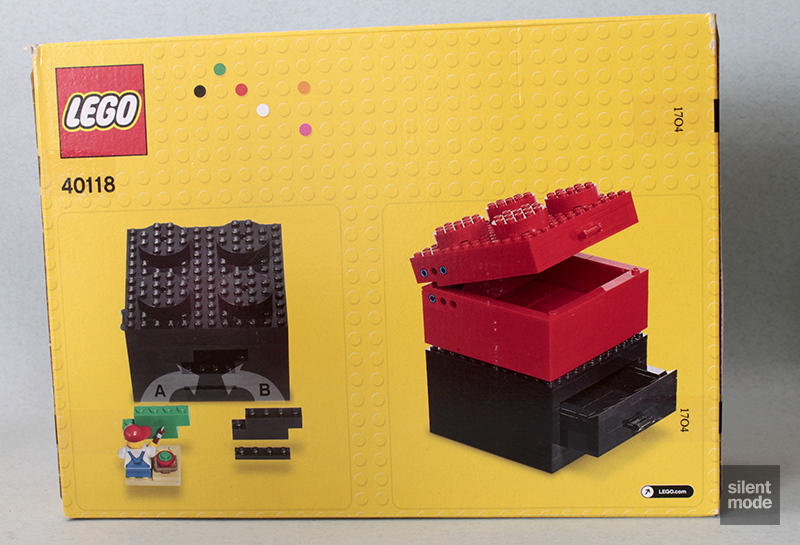 Then of course the top of the box is added, with the 4×4 round bricks representing LEGO studs. The end result is a brick 216 times larger than a regular 2×2 brick, by way of some show-off maths. The construction of the drawer, combined with the roof of the box, ensures it can open and close without a risk of being pulled out or getting stuck. Work on the red box also starts with the base. Note the use of the Red boat plates in the inner corners, which will prevent other boxes attaching to this one from underneath. More tile goodness, and even some cheese slopes line the top of the base. Bear with this if you think it looks strange, as I did: we’re just making some preparations for the lid of the box. 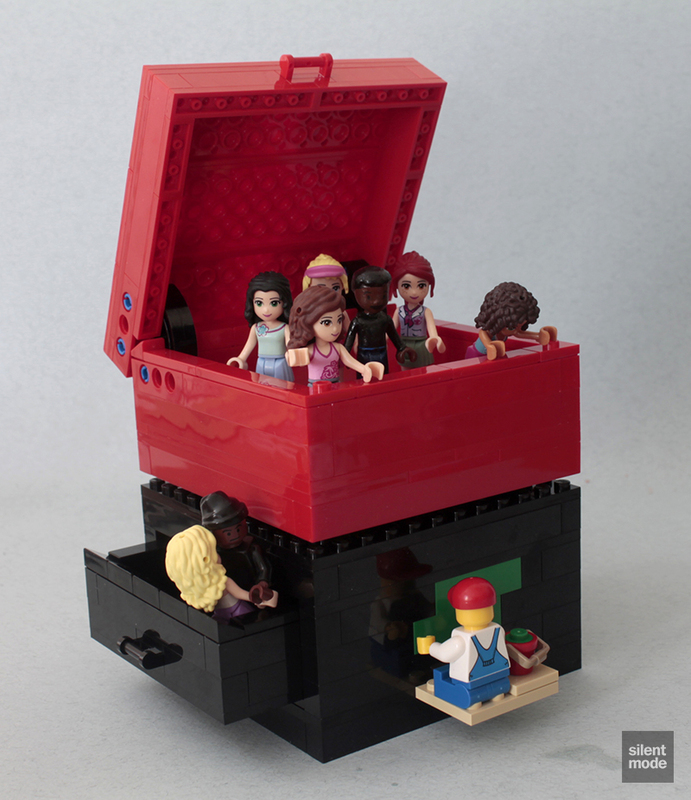 The lid begins life much like the one for the Black box: the remaining 4×12 plates are joined together by smaller plates, and the Red 4×4 round bricks form the studs. 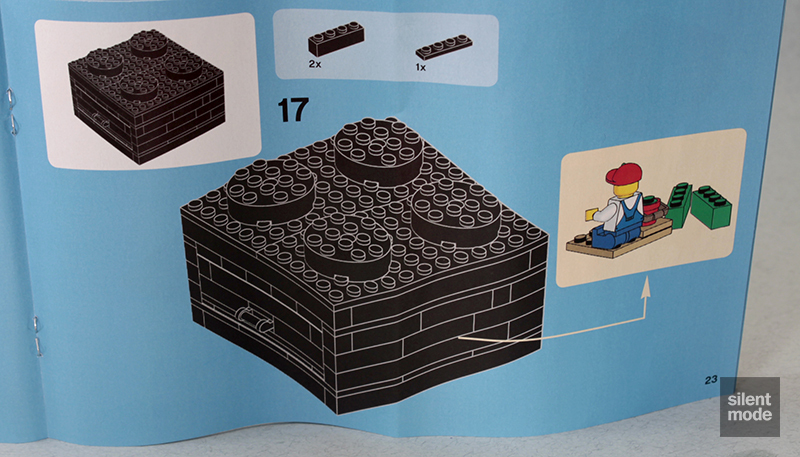 In no time at all, another set of Technic bricks will attach this lid to the base. Once some more tiles and a couple of jumper plates are added, we now have a box with an open and close lid – and one where the lid will stay closed. Woo-hoo! 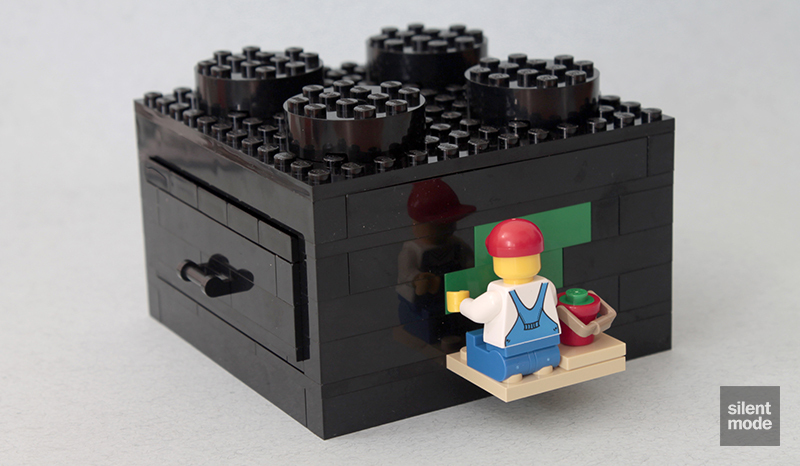 Make space on your office desk or in the corner of your bedroom, because here you have your very own storage boxes made of LEGO. 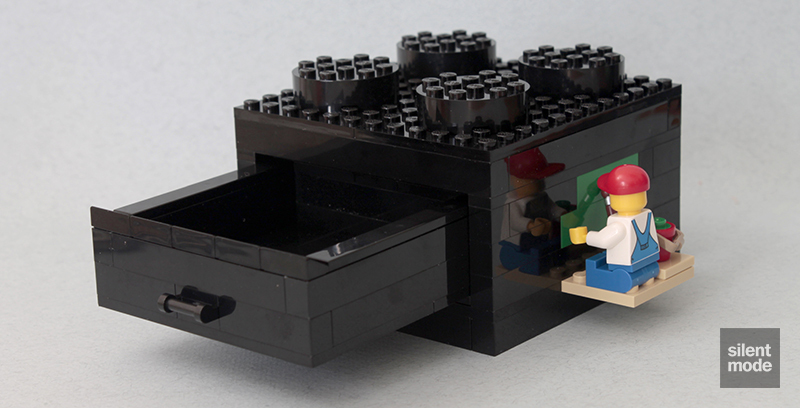 We’ve seen various displaying solutions in the past, so brick-built storage boxes were eventually going to happen at some point. You can arrange the boxes in any way you want, and they won’t attach to each other, so you won’t have to worry so much about parts coming loose. Should you opt to build the set as pictured on the box (with the painter and Green bricks), you’ll be left with these parts as spares. Another Artist brush is always welcome, or you may be lucky to find one in a Build-A-Mini station. 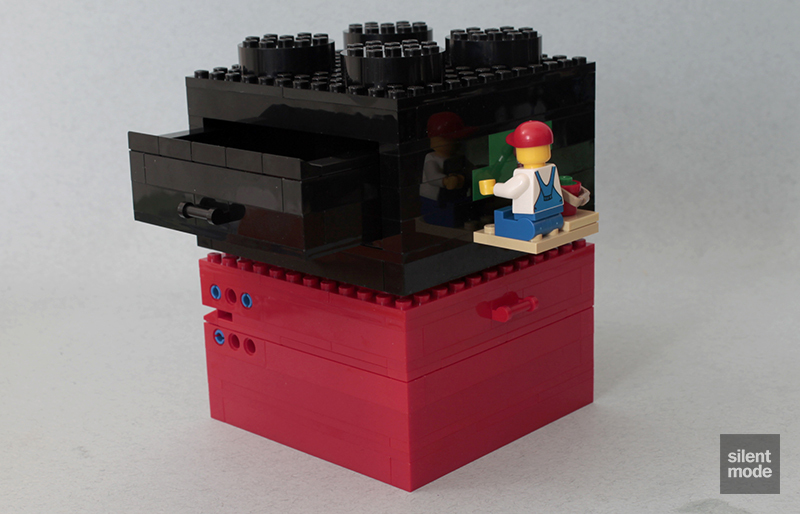 Should you wish to have a completely Black box, there are instructions for replacing the offending parts – but it will mean having to deconstruct the box if you’ve already built it. Compared to the other offerings under the “Other” label, this is a pretty good idea for a set, and it seems to have worked out. 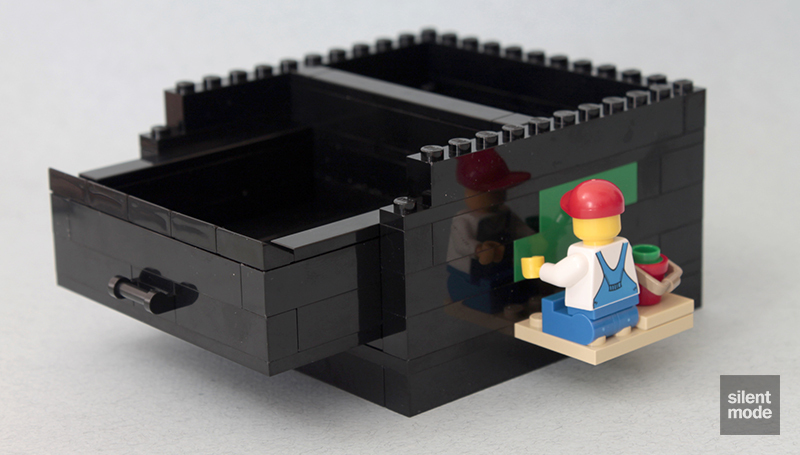 The builds are solid boxes, had no signs of coming apart at the slightest touch, and even though the storage areas are on the small side, they look like they can be useful for storing various trinkets and small items – perhaps even minifigures/minidolls and accessories. 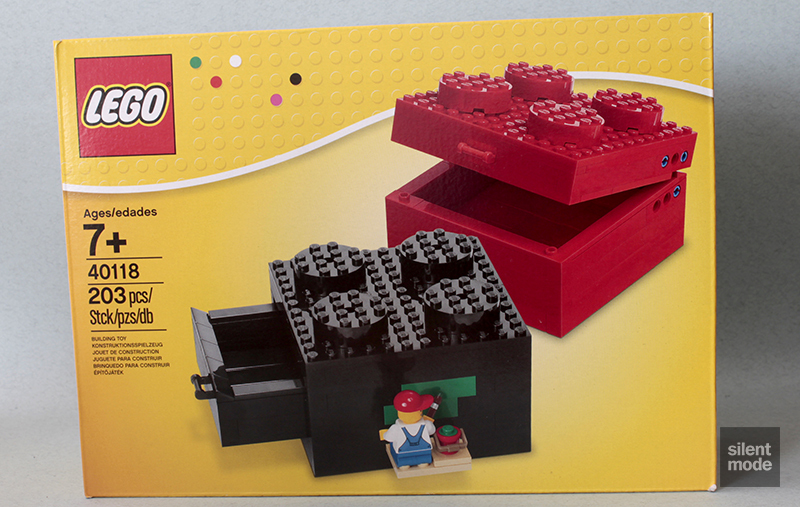 This is definitely a set to pick up as a gift, and an interesting look at how LEGO themselves would make a brick built storage box. You might even buy more than one, and have a go at making a 2×4 storage box, perhaps even a 4×4 box or some other odd shape. The choice is yours. The choice I’ve made is to give this set 6.8/10 – it’s a good one, so grab it while you can.